There is a range of services currently available to older people. Australia's Welfare 201321 published by AIWH, is a helpful resource that provides information on these. There is also informal support that may be provided by family and friends—ranging from assistance with self-care, mobility, communication, transport and household chores—many older people also receive services from a range of organisations, funded by Australian governments. The Productivity Commission’s Caring for Older Australians noted that volunteers contribute substantially to the delivery of some aged care services but also noted the lack of data on trends in volunteering for services and activities specifically targeted towards older Australians. Financially, many older people are directly supported by the Australian Government via the age pension. 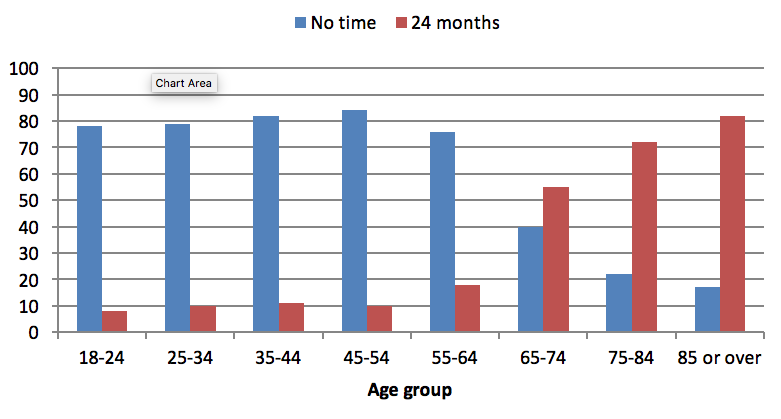 Australia's Welfare 2013 indicated that around three-quarters of people aged 65 years and over received an age pension or similar through Centrelink or from the Department of Veterans' Affairs and almost 60% of those receiving a Centrelink age pension received a full-rate pension (as at 30 June 2012). The ABS 2010 General Social Survey showed that dependency on government support as the main source of income increases with the age of the cohort (see Figure 11). Over half of those aged 65–74 years had government support as the main source of income over the previous two years, compared with 82% of those aged 85 years and over; whereas 40% of persons aged 65–74 years never had government support as the main source of income, compared with only 17% of those aged 85 years and over. There is also a range of community-based care programs to assist people to live independently. Changes were made to these programs as a result of the review by the Productivity Commission and the Government Response. The current range of programs is outlined on the My Aged Care website. Common forms of assistance include domestic, allied health, home and garden maintenance, transport and meals. Older Australians are also the most frequent users of hospital, pharmaceutical and allied health services. Access to services remains an issue for many, though. The ABS General Social Survey found that 25% of persons aged 65–74 years have had difficulty, compared with about 20% of those aged 75–84 years, and 10% of those aged 85 years or over.